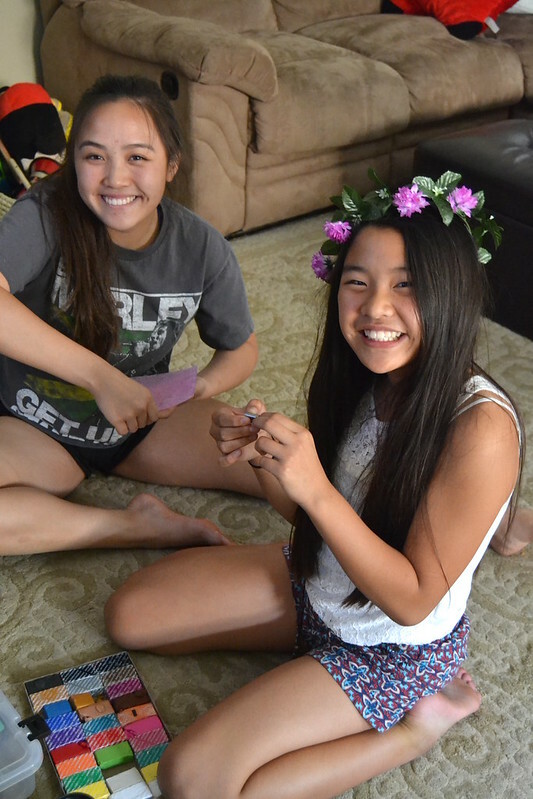 The other weekend we celebrated February in March. Or more accurately, we had February’s Sunday Family Dinner in March. February was totally hectic with the Lunar New Year, the family being up in San Francisco for our cousin’s wedding and just a bunch of random events that caused the delay for dinner. But the thing is, we couldn’t actually “skip” a month—because once you start doing that, those “monthly dinners” can continue to get pushed back and eventually become “every few months family dinners”. 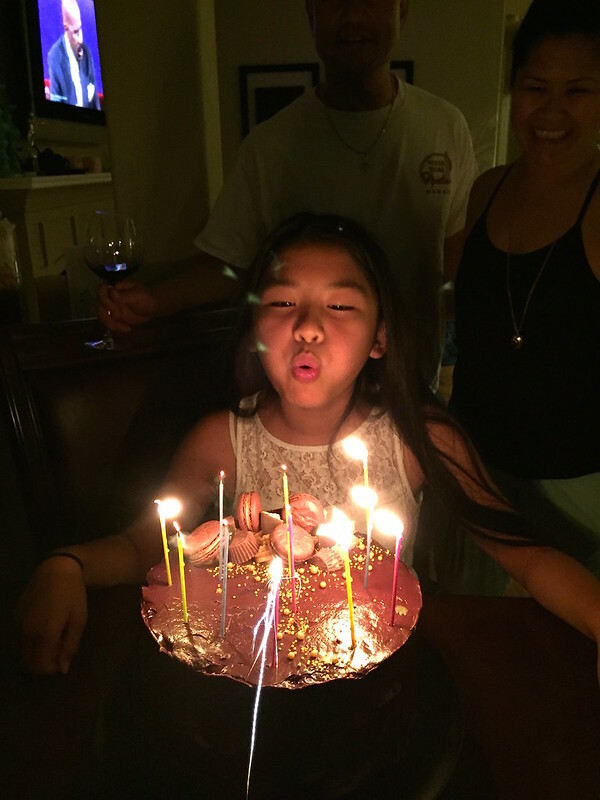 Plus, February was Maya’s birthday and we couldn’t skimp out on birthday celebrations for this cutie! 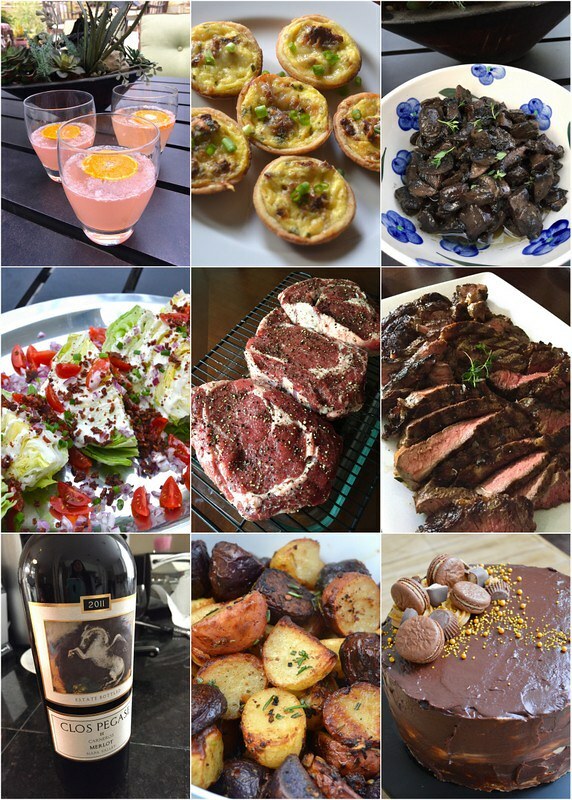 So per her request, we made a menu around some of the favorite things she loves — steak and cake! That day we decided to enact a new rule — unless you’re taking pictures of each other or food (which is more likely), everyone has to stay off their iPads and iPhones. Which, if you have teenagers and wee ones, can be torture! But if the point of us having monthly family dinners was to spend quality time with each other, being glued to phones and tablets (darn you Snapchat and Minecraft!) kind of defeated the purpose. So I went around and collected all their devices and didn’t return them until dessert – which is pretty darn good if you know our munchkins! 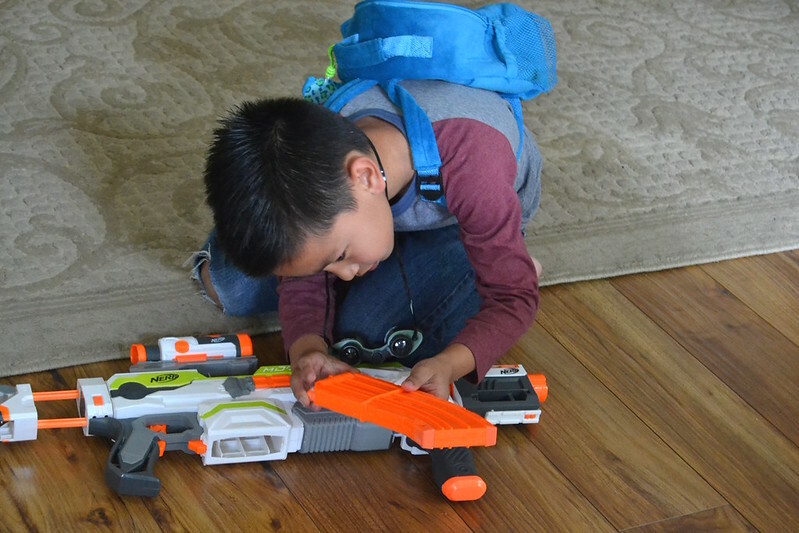 Without his iPad, Lucas had to resort to one of his other favorite obsessions — Nerf guns. Here he is intensely loading up on ammo. Afterwards, he spent a good hour running around the house, hiding behind columns and banisters as he went on full assault mode with his uncle. Those two have always been thick as thieves–ever since Lucas was a wee-bitty-baby. 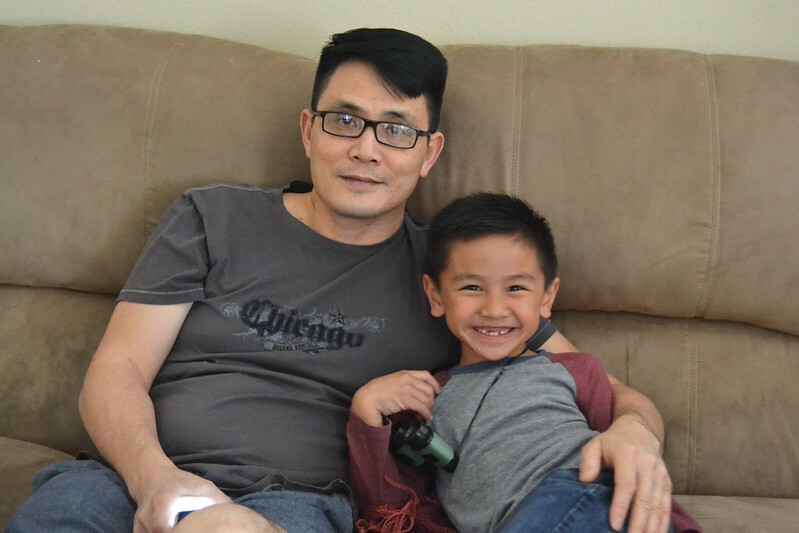 I used to think it was because he and my sister had two daughters and no sons—but I really think it’s because my brother-in-law definitely has a “kid at heart” gene. 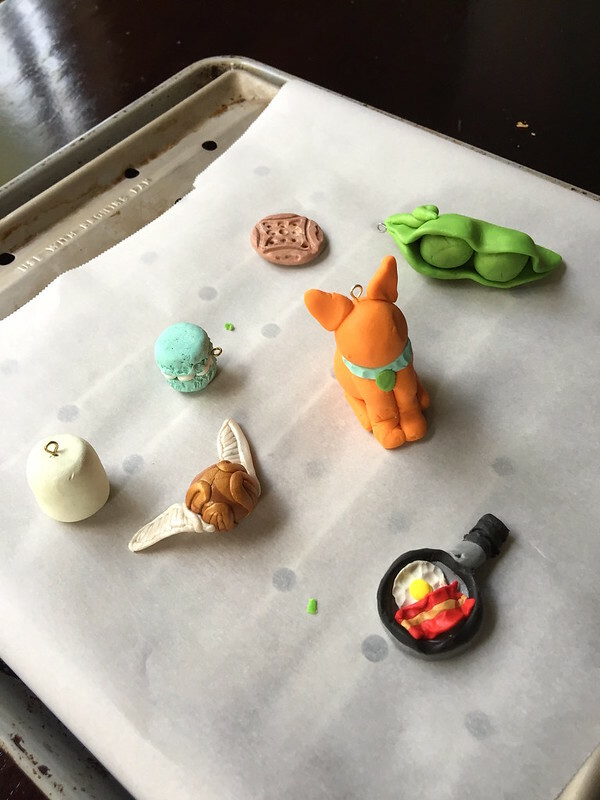 The girls decided to spend a considerable amount of time with Maya’s latest obsession – FIMO clay. The clay can be molded into whatever your imagination conjures up–then you bake it to harden your design. She has a TON of them in all different colors filling tackle boxes, tupperwares, and wherever else she can store them. They’re quite talented with it too! They made a golden snitch, macaron, marshmallow, a cat(?) and my favorite–a cast iron skillet with an egg and bacon! Then it was cocktail time! 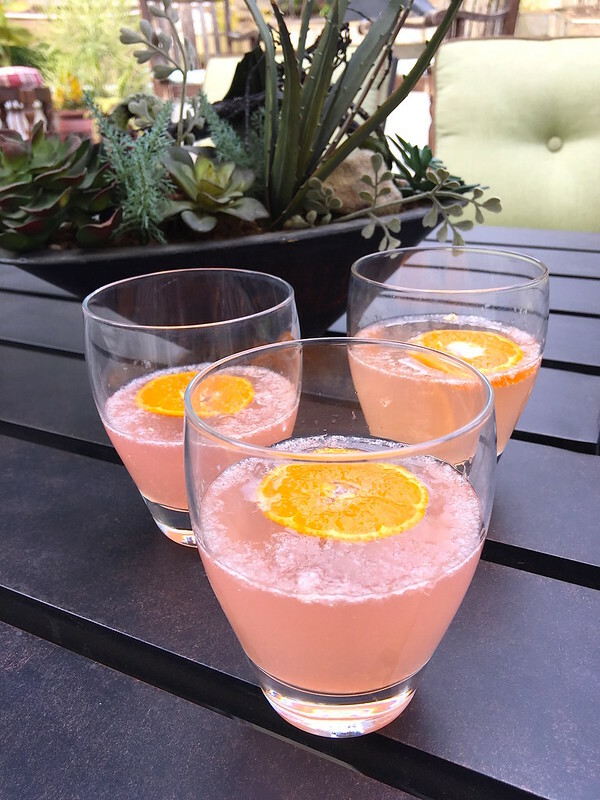 The adults sipped on Raspberry-Lemonade Sparklers….and by “sparklers”, I mean prosecco. We always need to nosh on a few things before dinner is served or else my “cute” family turn into a tribe of gremlins. 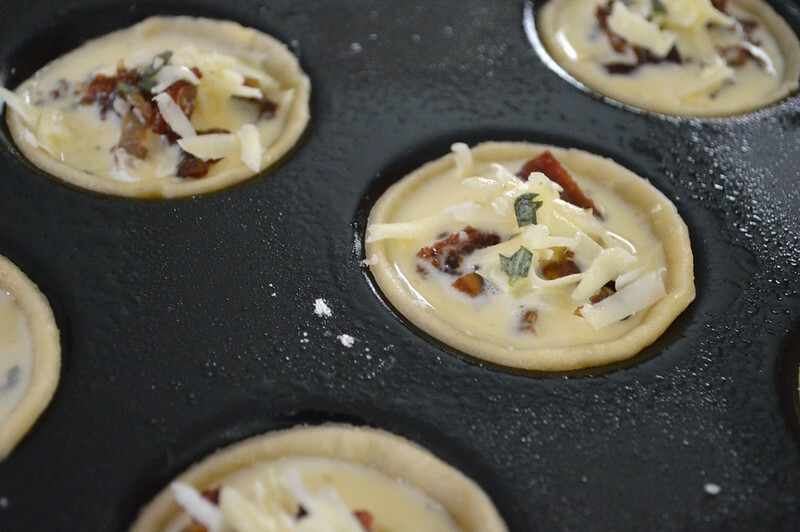 Big seester made these adorable little Tartlets that were like mini-quiches filled with bacon, gruyere, and custard all in a savory crust. Since birthday girl wanted steaks, she got STEAKS! 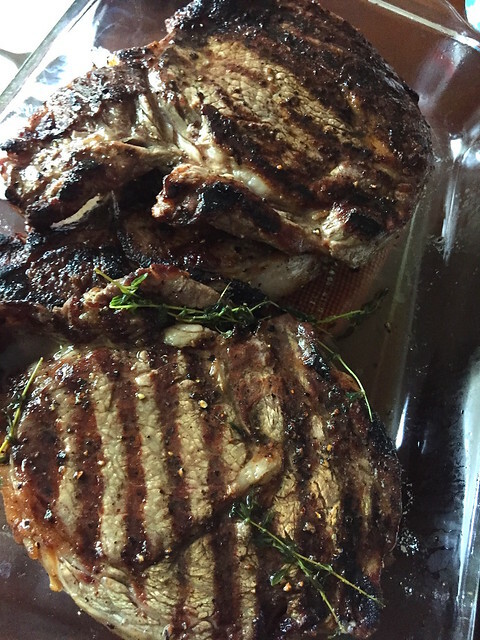 These were the beautiful boneless Ribeyes seestrah picked up. 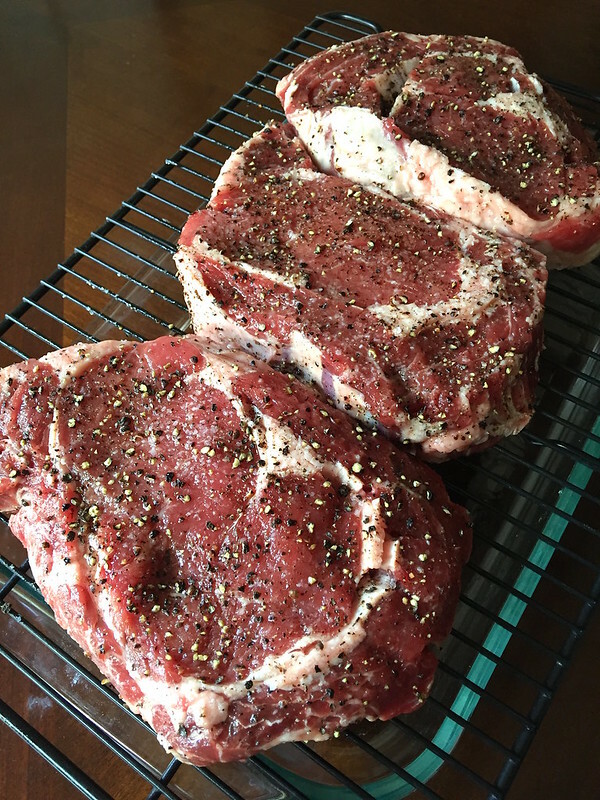 She simply seasoned them with lots of kosher salt and fresh cracked pepper. And oh that lovely marbling! They were then handed over to the boys to grill. 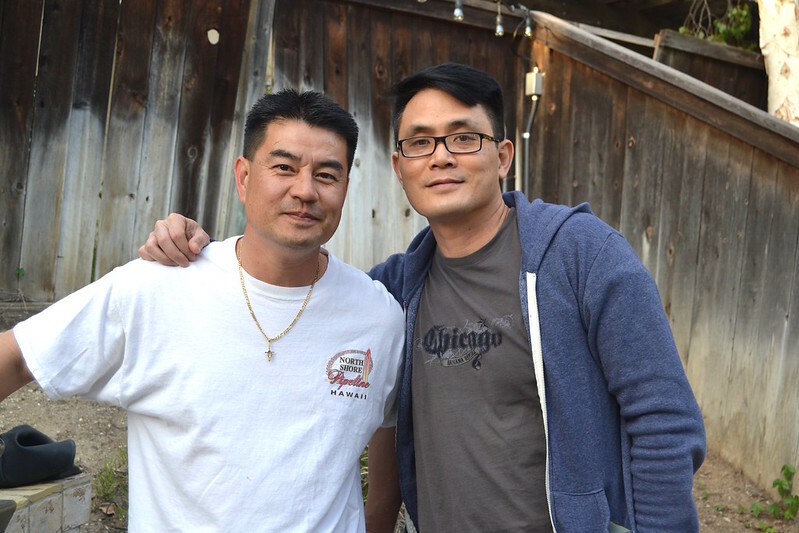 I must have a gajillion pics of R and C posing like this by the grill over past few years…. 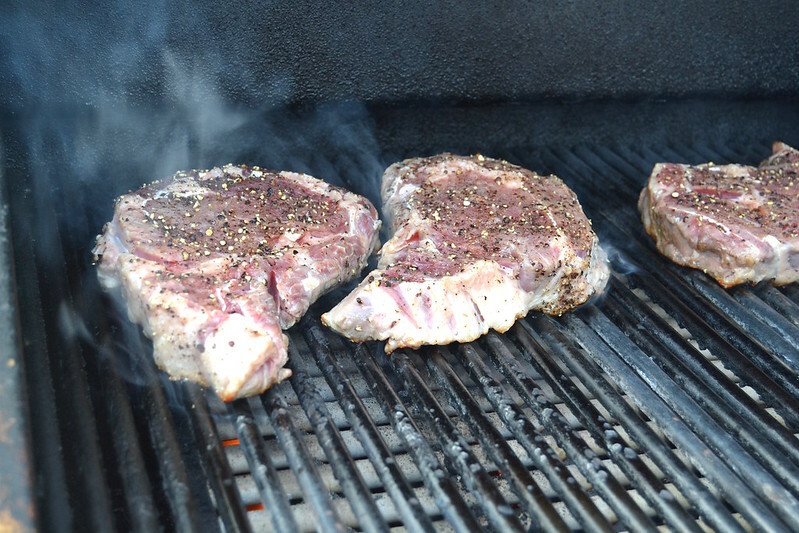 But hey–they like to grill so we put them to work! And no, I didn’t mean The Sizzler.…..but oh that cheese bread! 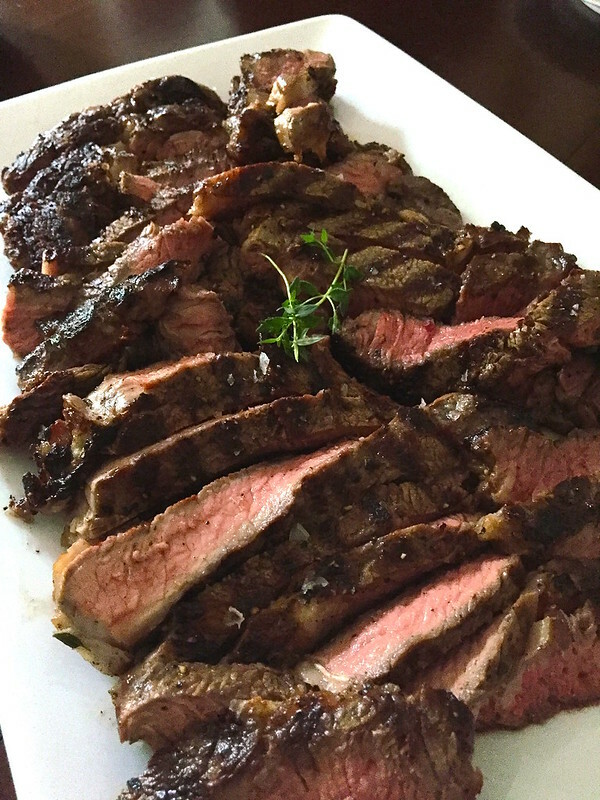 The grilled steaks were brushed with some herb butter while they rested which now gives me a great opportunity to talk about the sides! Maya loves salad–usually odd for small kids but she does have a mature palate. 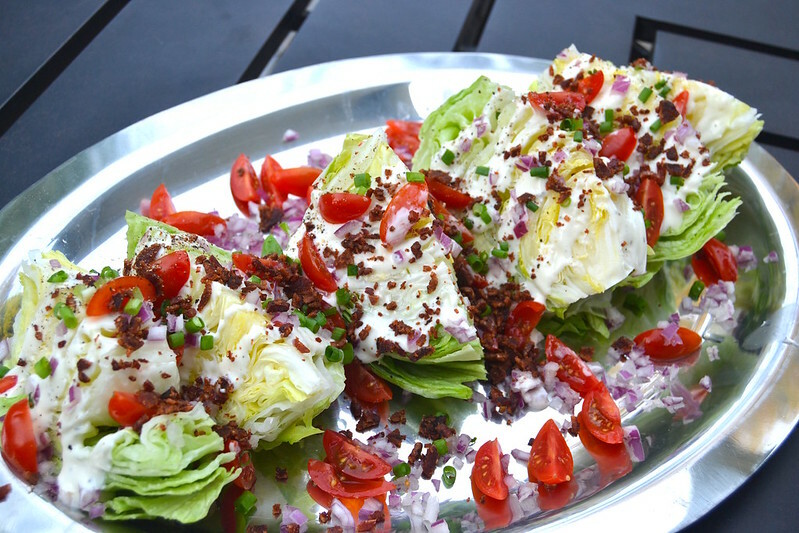 We put together a tray of colorful Wedge Salads because nothing makes veggies more healthy than dousing it with a creamy dressing and tons of crispy bacon bits. 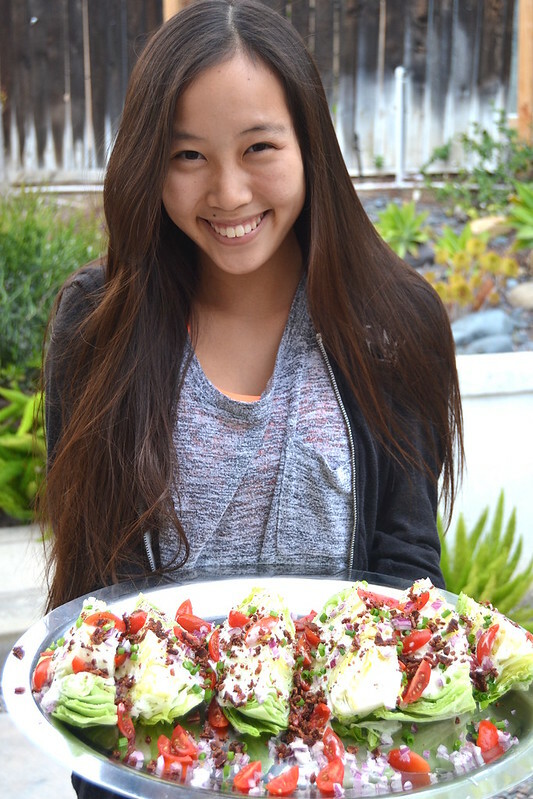 And since Nina helped with making it, I made her pose with the tray. 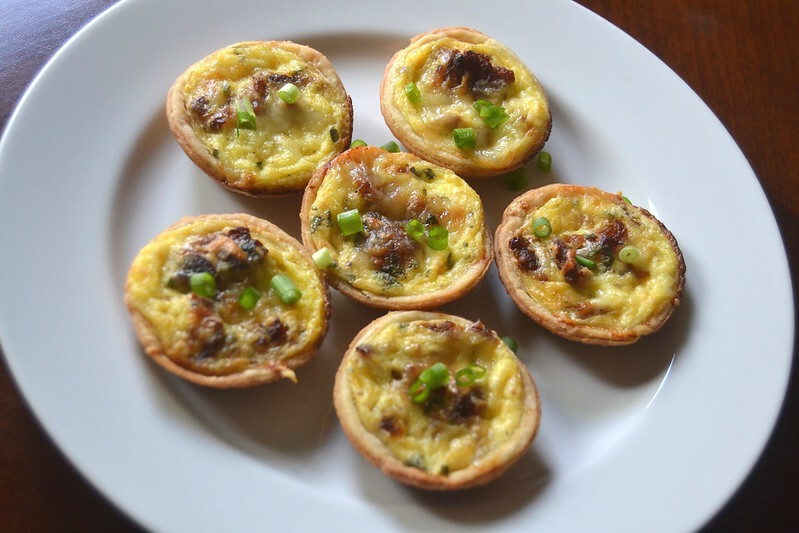 Think the kids will be traumatized by all the pics I make them take holding food? Nah…they make good profile pics, right? 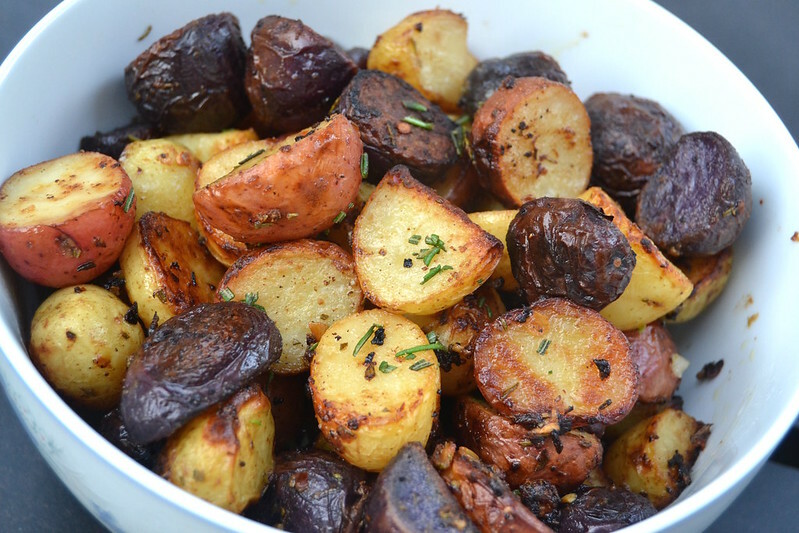 Next up, colorful Roasted Potatoes that were marinated in tons of garlic, rosemary, chili flakes and Dijon mustard before being blasted in a high heat oven. 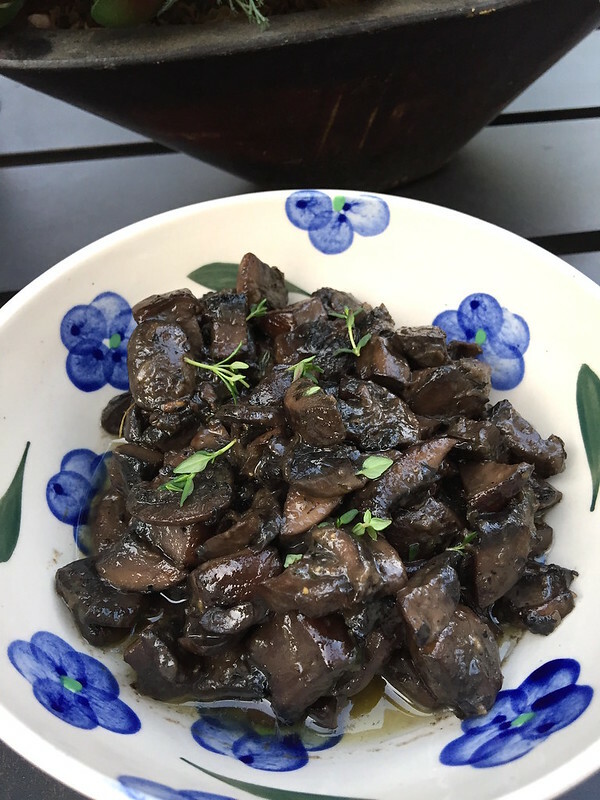 We also had a side of slowly Sauteed Crimini Mushrooms that were drizzled with truffle oil and fresh thyme. There may have been a few bottles of vino too…..
Here’s my plate with a little bit of everything…. OH! And I forgot about the Dirty Rice seester made as well! It’s cooked with onions, lots of butter, beef consomme, and a few other secret stuff. No idea…I never pay attention when she makes it but I am more than pleased to shovel it down by the large spoonfuls. After dinner, we tend to try and clean up a bit before dessert. And by “clean up”, I mean “take pictures”. When I asked Maya what kind of cake she wanted, all she said was a chocolate and peanut butter combo. Told you the girl had good taste! I started off with a wonderful chocolate cake by Brown Eyed Baker. I have to tell y’all, that crumb was oh-so-lovely! Super dense, moist and oober chocolaty! And there were three layers of it! I also used her version of peanut butter buttercream that was so lip smacking good! But this was for Maya and things had to be OVER THE TOP! 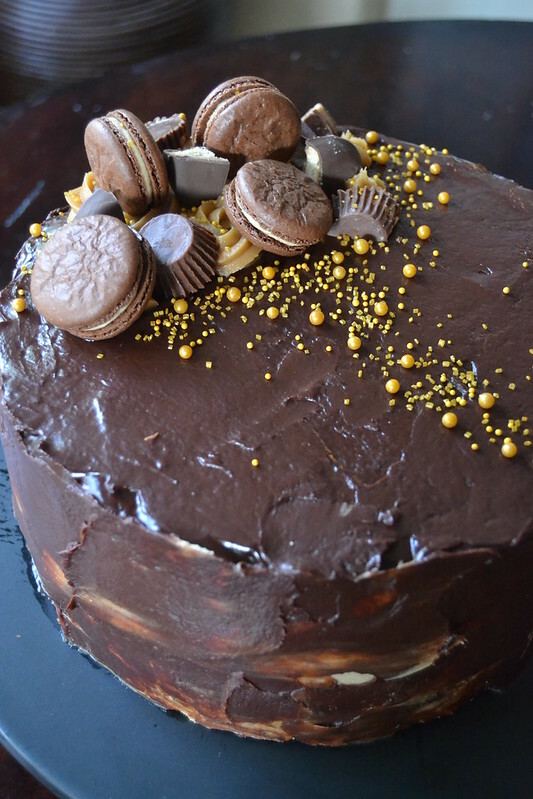 Although the chocolaty cake was frosted in the peanut butter buttercream, I added chopped mini-peanut butter cups in one layer and Girl Scouts Peanut Butter Patties in the next! Now, I had intended to frost the entire cake with that luscious buttercream and then do a drippy, drizzle layer of chocolate ganache like Brown Eyed Baker did for her Chocolate-Peanut Butter Cup Overload Cake. But I totally biffed it by making the ganache too thick and instead of making that whimsical-purposely drippy look, it turned into a gloopy mess. AGH! So I took seester’s advice and decided to frost the ganache out into a thin layer—and I actually kind of loved the marbling effect it had. 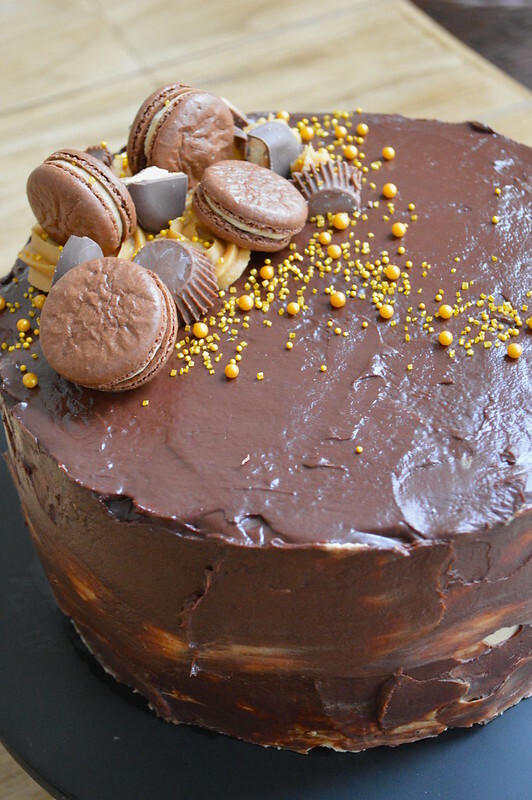 To top the cake I added more Peanut Butter Patties, mini-peanut butter cups, 3 different types of gold sprinkles and wait for it–freshly made Chocolate and Peanut Butter Macarons. 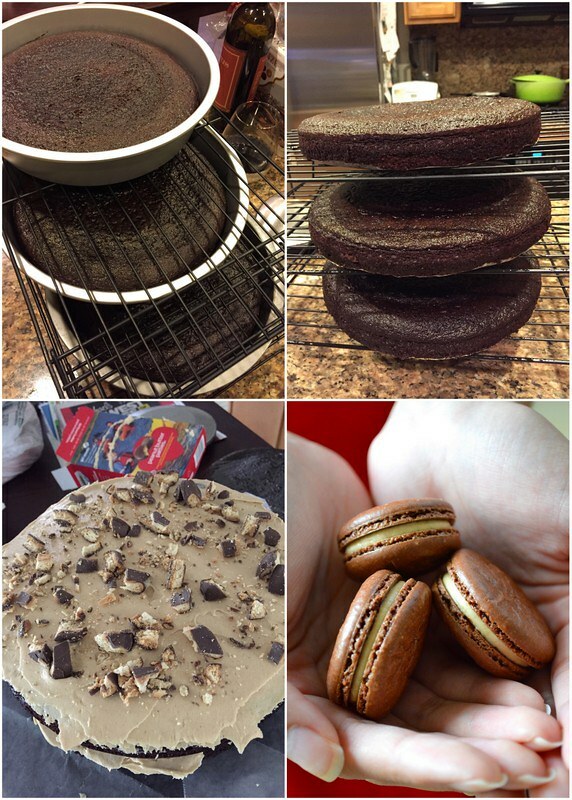 Wait–did I say I baked macarons just to top the cake? I SURE DID!!! 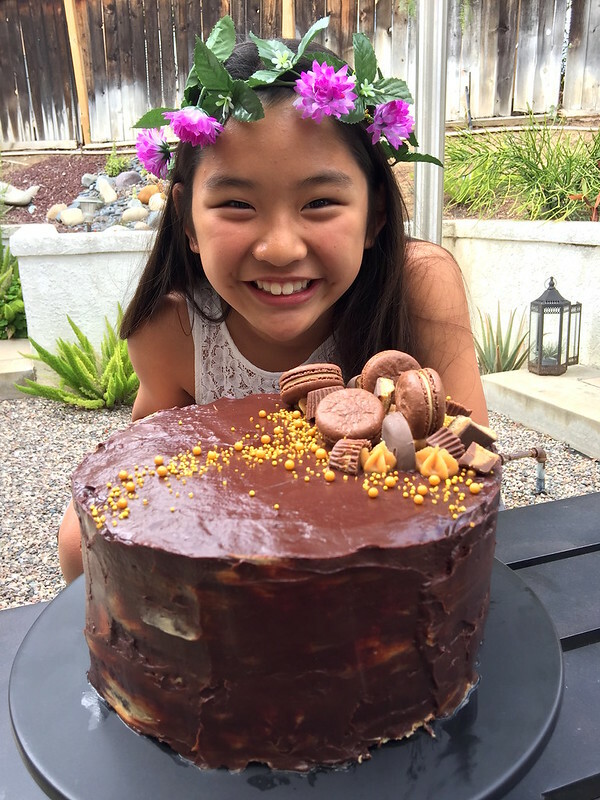 Because Miss Maya LOVES macarons and I promised her an OVER THE TOP cake. 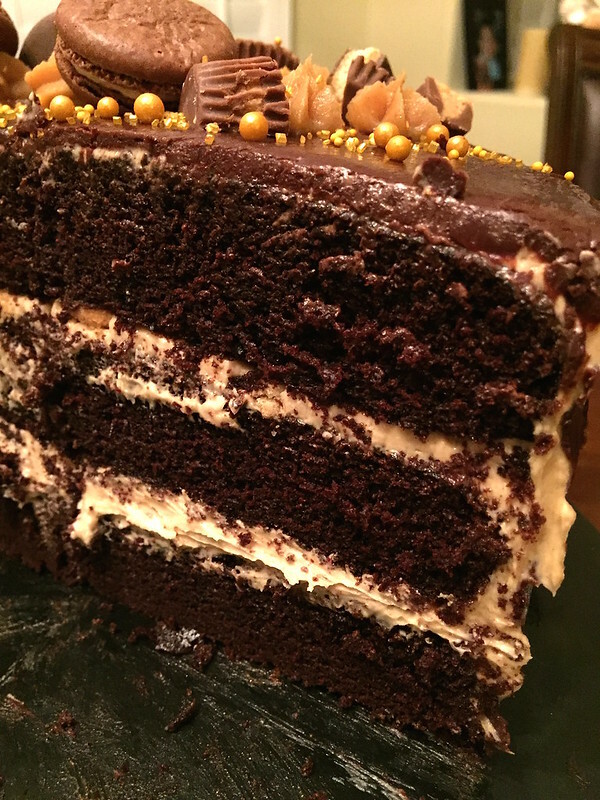 Here’s a quick peek inside of the cake…..and let me just tell you, a tall and icy glass of milk would go perfect with it! Except I can’t drink milk…..TMI? 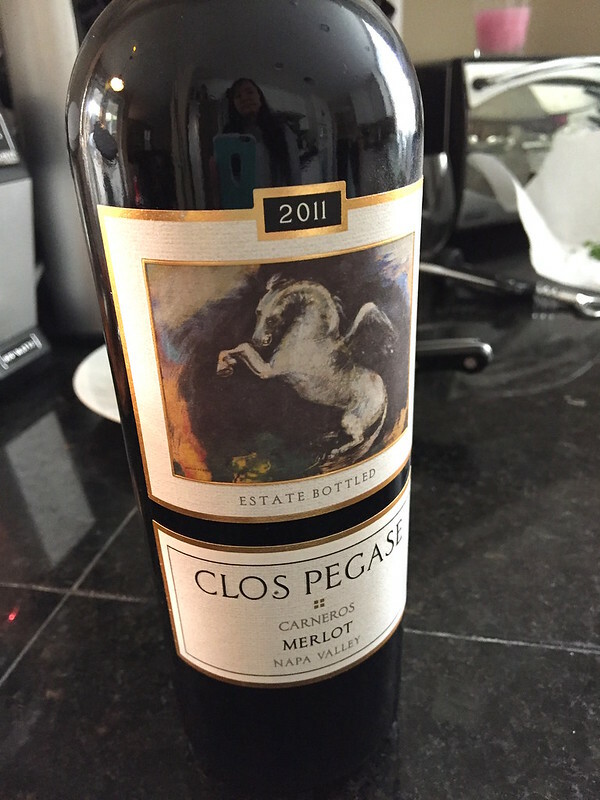 So I had it with red vino instead. All in all, I think birthday girl forgave us for having her dinner so late—though, she’s such a sweet tempered kid that I don’t think she really minded at all. Previous Post Chocolate and Peanut Butter Macarons – Happy Macaron Day! Wow it all looks so delicious! 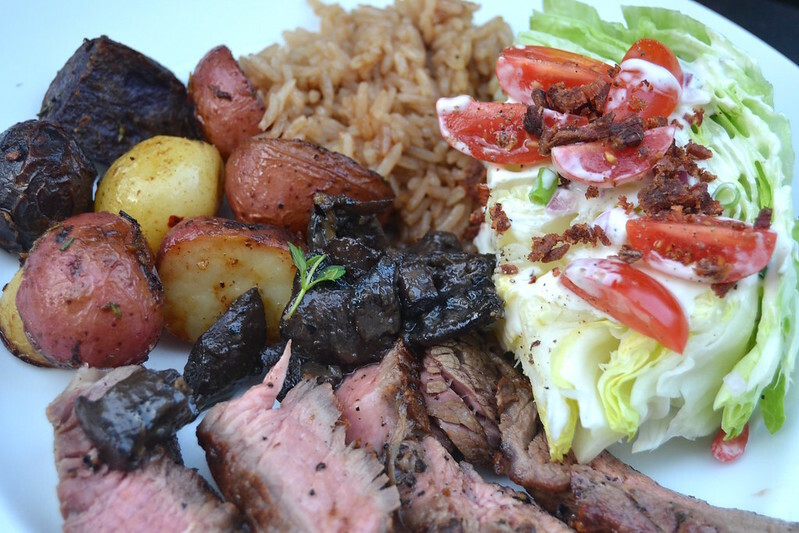 I love a good ribeye and a wedge salad. You have such a pretty family! I totally enjoyed reading this. It was almost like being there :). Actually, if I had to write a post about a family dinner, it would sound a lot like yours which is probably why I enjoyed your post so much. Thank you Nathalie! Sounds like your family and my family would get along quite well then at dinner! 🙂 Cheers to you and thank you for stopping by! The cake looks absolutely divine. 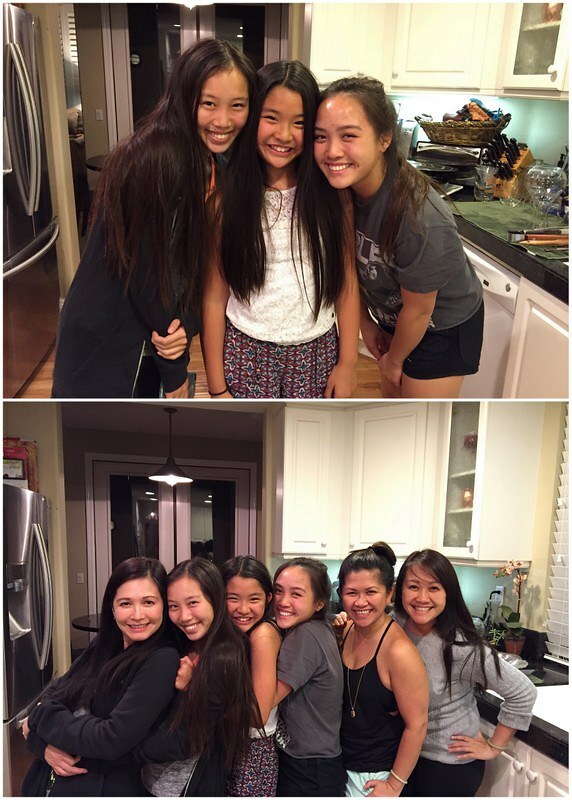 Pingback: Family Dinner Celebrates the January Babies!